We have had quite a few kind of “meh” TKTs recently, so I am happy to report a success! I saw this recipe a few weeks ago on my Twitter feed, and it finally felt like the right time to try it. 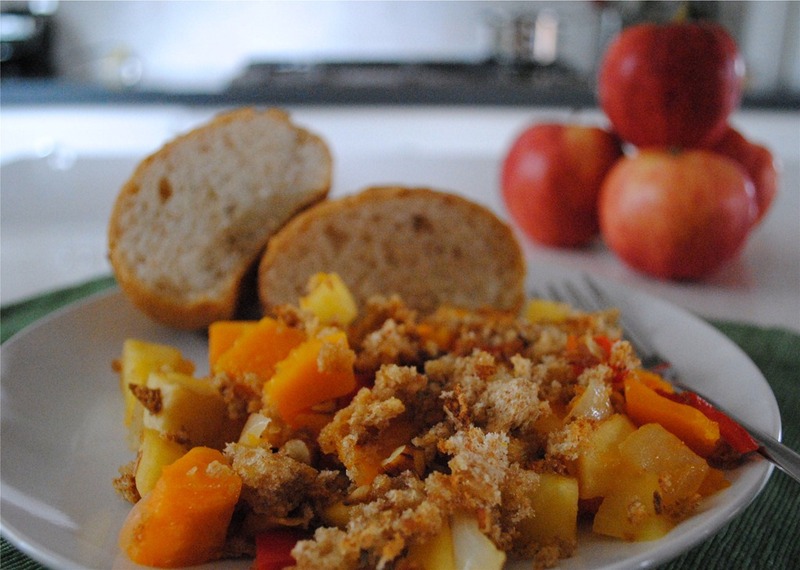 Butternut squash and apple go really well together, so it is not surprising they pair well in a casserole. This dish is a little high maintenance on the prep side, as there is a lot of peeling and chopping, but, that is par for the course when you’re using winter squash. I didn’t have celery so I substituted red bell pepper, and didn’t have pecans, so I used almonds, but otherwise stuck to the recipe exactly. 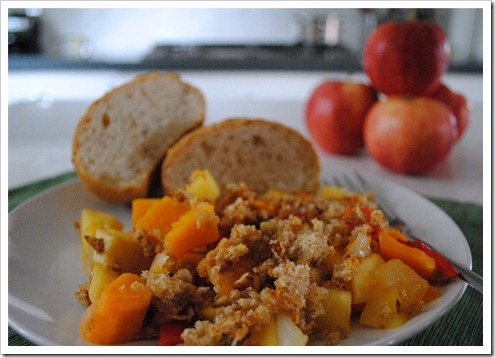 Though there is a bit of prep, the recipe is fairly easy and fool-proof, and makes a nice side dish for winter dinner. Time Required: This took me about 20 minutes to prep, 20 minutes to cook on the stove, and 10 minutes in the oven. I didn’t know how this would go over with my finicky 2Chili, but he quite liked it. I thought this was just delectable. I served it with a side of wild rice and ended up getting the rice mixed in with the casserole – that was so good I will mix the rice in next time I make this. A winner for a side dish or even main course with a couple veggie sides. this looks (and sounds) delicious!! might have to try this one out. It’s really good – and passed the finicky hubby test with flying colors. He actually requested it for leftovers – that is huge!